There is a Wastewater Treatment Plan proposed to be erected beside IKEA. It will release hazardous gases which are dangerous to all of our health. These gases will have a foul odour making for a very unpleasant smell in our area. Should the building go ahead there will be major issues with traffic during its creation and ultimately it will devalue our properties. More information can be seen on our website or facebook page. Attention all residents of Hampton wood Estate help us and If you object to this pipe being built beside our estate please sign this petition. 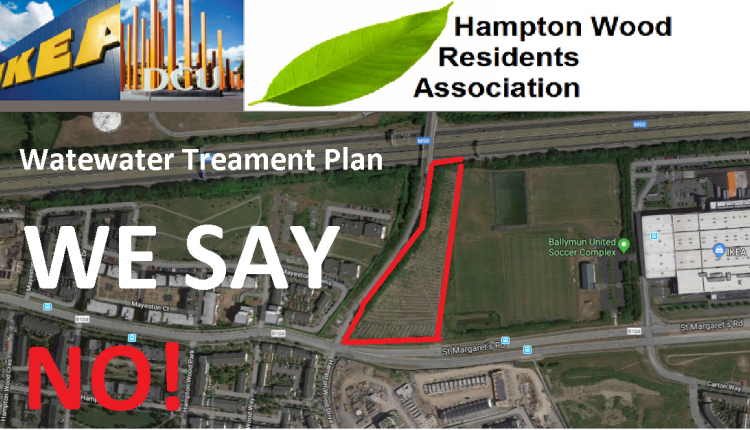 The Stop Wastewater Treatment Plan petition to Dublin City Council; Fingal County; Irish water was written by Hampton Wood Residents Association and is in the category City & Town Planning at GoPetition.